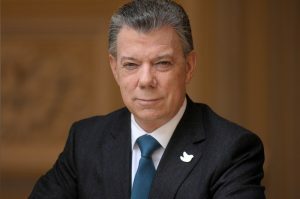 Juan Manuel Santos was born in Bogota on 10 August 1951. He was a cadet at the Naval Academy in Cartagena and studied Economics and Business Administration at the University of Kansas. He has also completed post-graduate studies at London School of Economics and Harvard University. He was Chief of the Colombian delegation to the International Coffee Organization (ICO) in London; he was the last Designate to the Presidency, and Colombia’s first Foreign Trade Minister. He also served as Finance Minister and National Defense Minister. Santos created the Good Government Foundation (Fundación Buen Gobierno) and founded the Partido de la U political party in 2005. As a journalist, he was a columnist and Deputy Director of El Tiempo newspaper; he was awarded the King of Spain Prize and served as president of the Freedom of Expression Commission for the Inter-American Press Association (IAPA). He has published several books, Third Way, co-authored with former British Prime Minister Tony Blair, and Check on Terror (Jaque al Terror), in which he describes the most important actions against the FARC guerrillas during his tenure as Minister of Defense, among other publications. On 20 June 2010, he was elected as President of the Republic of Colombia for the 2010-2014 term, with over 9 million votes. He took office on 7 August 2010. In August 2012, he publicly announced that his government was working on a peace process with the FARC. On 15 June 2014, with more than 7.8 million votes, he was reelected as President for the 2014-2018 term, with a government plan based on three pillars: Peace, Equity and Education. As a result of his tenacity and dedication to achieve peace and reconciliation in Colombia, the Norwegian Nobel Committee awarded him the Nobel Peace Prize in 2016 for his resolute efforts to bring the armed conflict to an end. The Nobel Committee added that the distinction “is a tribute to the Colombian people who, despite great hardships and abuses, have not given up hope of a just peace, and to all the parties who have contributed to the peace process”. Peace has been a driver throughout Santos’s entire life. The Nobel Peace Prize summarizes a path, his relentless pursuit for peace in Colombia. The year 2017 was marked by several acknowledgments. On January, he received the Global Statesman award during the World Economic Forum in Davos, Switzerland, for his efforts to achieve peace in Colombia and for his distinguished career as a world leader. Later that year, on April, Time magazine included him in the 2017 list of the 100 most influential public figures in the world, among other leaders such as Pope Francis and British Prime Minister Theresa May. He was the only Latin American leader included in that year’s list. Santos is married to María Clemencia Rodríguez, with whom he has three children: Martín, María Antonia and Esteban.